Today’s small wear-and-tear issues could easily become tomorrow’s foundational failures. While having and following a long-term preventive maintenance plan, that includes sealcoating and crack repair, will help protect your asphalt investment, you may also find times when your pavement needs repairs. After all, you can’t stop Mother Nature; you can only slow her down. Patching is a common asphalt repair on areas of pavement with potholes. We contract a full range of repair solutions when your asphalt pavement needs it most. From patching individual potholes to replacing larger distressed areas, our maintenance professionals are trained to identify your problem areas and provide the right diagnosis to prolong your surface – while minimizing the impact on your budget. If your asphalt is showing signs of wear, don’t wait – request a free consultation for your current repair needs, and talk to us about developing a long-term maintenance plan that prevents future damage. 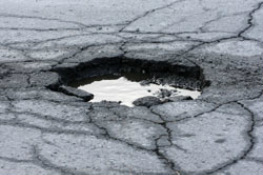 Potholes occur when water seeps into pavement through unsealed or improperly sealed cracks. When the water freezes, it expands and enlarges the crack. When the ice under the pavement melts, a void is left. Surrounding pavement falls into the void and forms a pothole. Failed areas or liability issues on your parking lots and roadways are justifiably important concerns. But the presence of these concerns does not mean that repaving or other major scopes are necessary. Patching asphalt allows you to repair these particular areas in a cost-effective way. Cold patch is by far the most inexpensive, quick-fix option for patching a pot holes, and can be purchased a local hardware store. However using this method is ONLY a temporary and will deteriorate the fastest. This method is often the most expensive option. The cost for asphalt removal & replacement depends upon the geographic location, the amount of grading and substrate work required, and other site-specific factors. The broken, failed, or liability areas are cut square with a jack-hammer or saw cut (depending on the region or by request) and excavated to the aggregate sub-base). The broken asphalt is removed and hauled away. 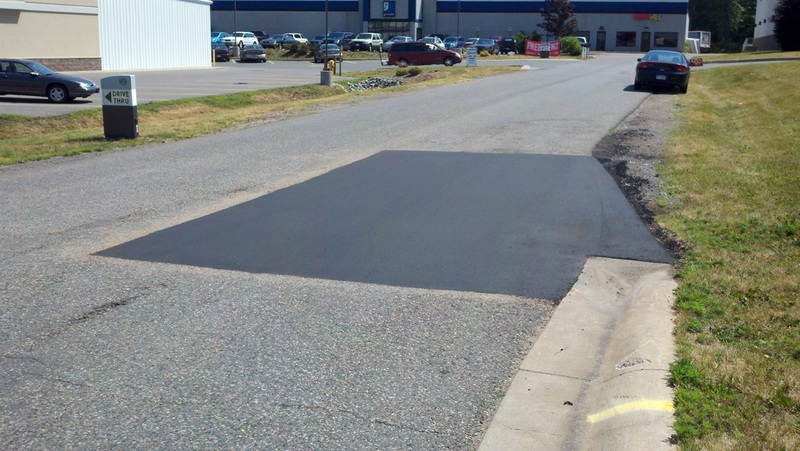 New hot asphalt is installed at an average compact depth of 3”. 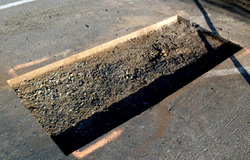 Finally, edges are sealed with asphalt emulsion to improve bonding with the surrounding existing asphalt.In situations with a large amount of patching in one parking lot or roadway, asphalt milling (or scarifying) options are also available, which uses specialized milling equipment to cut down on excavation time. Infrared Asphalt Repairs are a cost-effective way of pavement-related headaches, reducing liability issues from potholes and rehabilitating deteriorating asphalt. 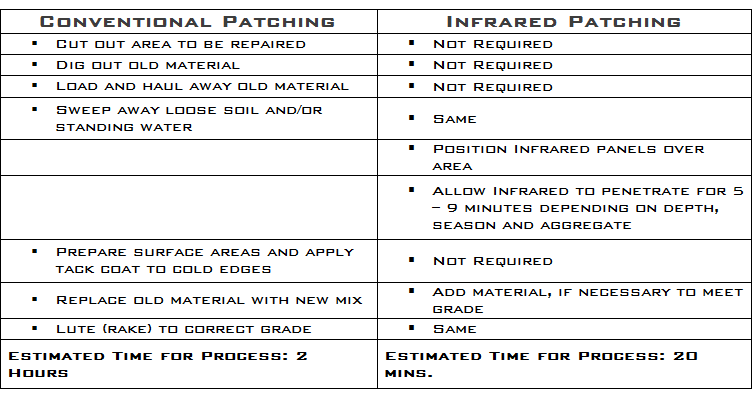 Whats is Infrared patching ? Infrared patching is a method of blending new asphalt with infrared heated existing blacktop to create a thermal joint-free integral patch. The machine does this by creating infrared heat waves that are capable of heating the existing asphalt to a working temperature of approximately 300 degrees F. plus, penetrating to a depth of nearly three inches. Since the machine uses thermal heat energy, and has no direct flame, the bituminous asphalt is not burnt or oxidized. Next the deteriorated asphalt is raked and removed, and new asphalt is added and blended/mixed into repair area. Finally the edges a feathered and the area is compacted with a vibratory roller. These final touches, tie the edges of the new patch to the surrounding existing asphalt without seams. - The finished product has the same or better life expectancy as the surrounding asphalt. - Typically this method of repair is frequently less costly than removal scopes and involve considerably less down-time or impact on the property. How does infrared technology work?